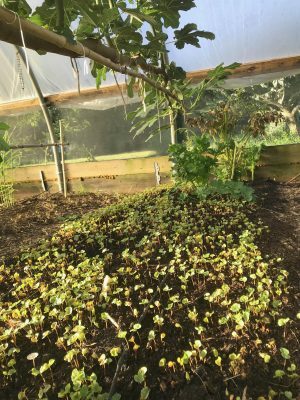 About a month ago the greenhouse was looking messy as oxalis, grasses, chickweed, and other weeds were starting to carpet the mostly bare ground. An unacceptable situation, considering that a month hence — now — I would need the space for planting in preparation for fall and winter. The first step back in August was, obviously, to clear away the weeds, pulling almost each and every one out, roots and all. As long as weeds aren’t too overgrown or too abundant, the job is pleasantly satisfying. Moist soil also helps. Because I’ve grown a number of varieties of blueberries for a long time, I’m often asked what variety I would recommend planting. Or whether you need to plant two varieties for cross-pollination in order to get fruit. The answers to both questions are intertwined. 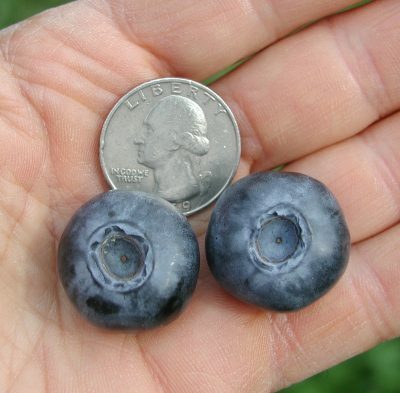 First of all, blueberries are partially self-fertile so one variety will bear fruit all by itself. Benefits of cross-pollination aside, why plant just one variety of blueberry? Different varieties ripen their fruits at different times during the blueberry harvest season. With a good selection of varieties, that season can be very long. Over the years I’ve shared the joys and frustrations of growing figs in my minimally heated greenhouse. The joys, of course, have been in sinking my teeth into fruits of the various varieties. Also, more recently, the neat appearance of the plants which are trained as espaliers. Left to its own devices, a fig can grow into a tangled mess. 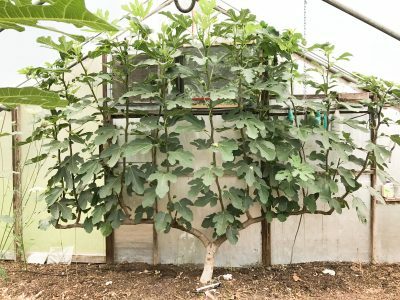 In part, that’s because fig trees can’t decide if they want to be small trees, with single or a few trunks, or large shrubs, with sprouts and side branches popping out all over the place. I finally am getting to eat some ripe mulberries this year, and they were — and are — very, very good. The wait wasn’t because the tree was too young. 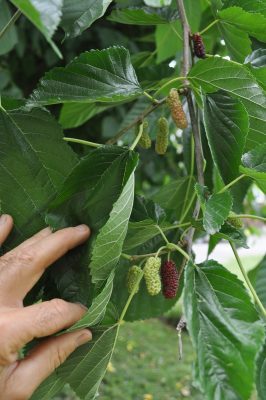 And anyway, mulberries are very quick to bear fruit, often the year after planting. I got to eat fruit from my tree this year because resident birds have been kind enough to share some with me. Of course, it was not really kindness on their part. Birds also eat fruit for their juiciness, and the past weeks and weeks of abundant rainfall probably satisfied some of that need. The only other year I had plenty of mulberries — much more than this year — was a few years ago when 17-year cicadas descended upon here. All summer I awoke to their grating cacophony, but did feast on mulberries as birds feasted on the cicadas.